Samsung's upcoming Galaxy Note 9 will probably not be announced before August, but the company is - unsurprisingly - already testing the phone. Just a couple of days ago, a Snapdragon-based Note 9 was benchmarked on Geekbench, so we now have a new pseudo-proof that the handset exists (most likely, no one was doubting that anyway). 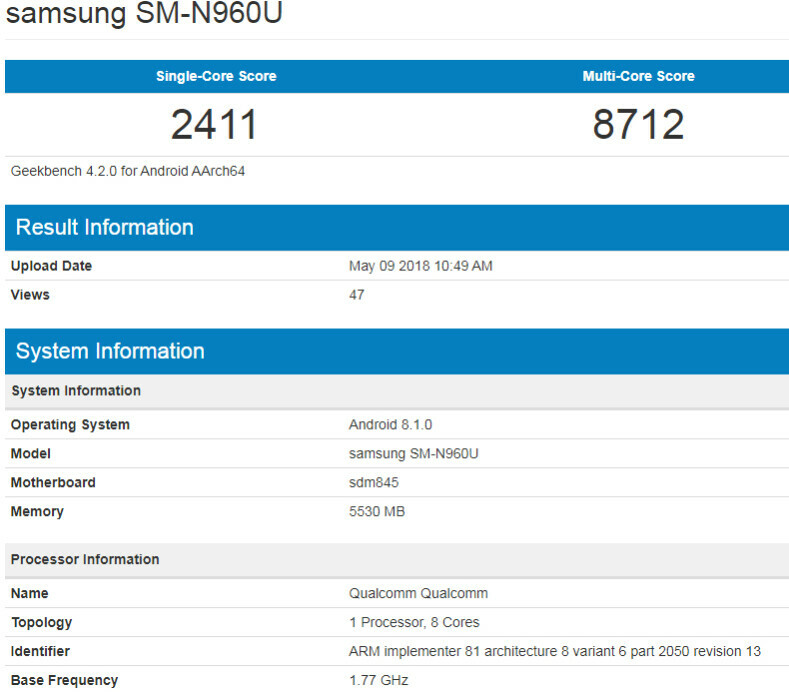 The new Galaxy Note phone that's been benchmarked has the model number SM-N960U. This is almost certainly a US-bound Note 9, as it succeeds the SM-N950U - one of the official US variants of the Samsung Galaxy Note 8 (pictured above). The phone is listed as featuring Qualcomm's Snapdragon 845 processor and 6 GB of RAM. We have to mention that it's the second time when we're seeing the SM-N960U on Geekbench, the first time being back in March. Both now, and in March, the smartphone was listed with the same CPU and RAM amount, as well as with Android 8.1 Oreo on board. While a singular listing may be inaccurate, when we have two of them showing similar specs, it's highly likely that they are accurate. 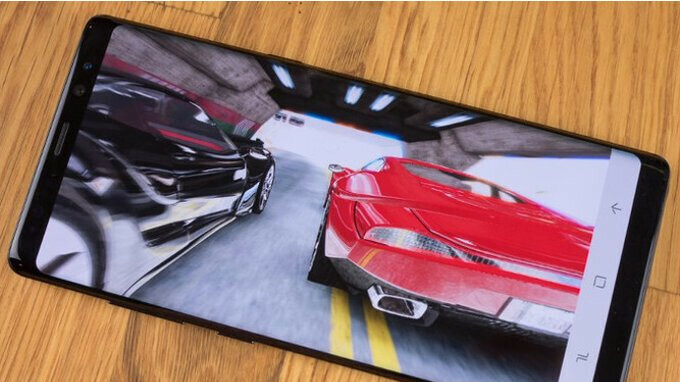 The new benchmark test reveals single-core and multi-core scores similar to those of the Snapdragon 845-based Galaxy S9. However, since this has to be a pre-production Galaxy Note 9, we shouldn't read too much into these scores. Earlier this month, an Exynos-based Galaxy Note 9 was reportedly tested on Geekbench. While that may have been a fake test, we're pretty sure that a Note 9 featuring a Samsung-made Exynos processor is also in the making, although not for the US market. Interestingly, the Exynos variant could come with 8 GB o RAM, instead of 6 GB. Regardless of the processor powering it, the Samsung Galaxy Note 9 will probably not look too different from the Note 8. But that's not a bad thing, right? Thanks for the tip, Shaw! Yeah it is a problem. It’s going to make me feel just like i did upgrading my S8 to an S9. I ended up taking it back and these bench,ark scores aren’t nothing to write home about either. Is this the same story you people will say every year about Samsung? I have a Note 8 and an old Sony Z5 Premium. Z5 Premium is noticeably faster despite old specs. Samsung version of Android is bloated and slow. Stop telling lies ! I have a note 8 since September last year and is fast like hell. I also have an xperia xz ; my note is faster. Only buy snapdragon versions of samsung and only if bootloader has been successfully unlocked. It is the only reason i did not buy the S8, can't deal with knox and all the samsung bloatware. Dude, this is not an Apple article. So, stop bashing Apple in a Samsung article. That still doesn’t changes the fact that Sony’s mobile division is falling day by day. Finally say hi to A10X...man it took a long time, but we are getting closer. The A12 processor said WTF...that’s all you have. I’ll wait to see you in 2020. And the A10x said, "Sorry I lost real world speed tests to the Note 8 and S9. Kind of embarrassing." A10X says "I have been multitasking since iOS 4. You are now just knowing that? Remember that was back in 2010 when I was A4/A5 chipset. Dex who? Dex Pad? Is this a cheesy mockery of Chrome OS. MacOS serves a purpose of our macbook lineup that is much more powerful than web OS. As an A10X processor...I have one question...how many Dex Pads have been used and sold?" take note. That's how you do it. Don’t start. iPhones have the decency to optimize their phones for their customers while we just get spaghetti at the wall and check and see how long it holds up.